2.1" x 3.2" stitched on 14 count. 1.6" x 2.5" stitched on 18 count. Easter Egg Collection cross stitch pattern... 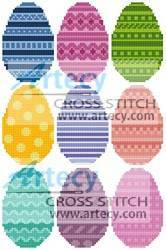 These nine counted cross stitch patterns of Easter Egg designs were designed by Artecy Cross Stitch. Only full cross stitches are used in this pattern.